Director Kevin Smith sent out a mysterious tweet last week, where he revealed his production schedule for the next year and a half, ending with a cryptic hint that a sequel to Mallrats may be happening. Just a few days later, the filmmaker confirmed his plans for the sequel, stating that he could start production by May 2016. 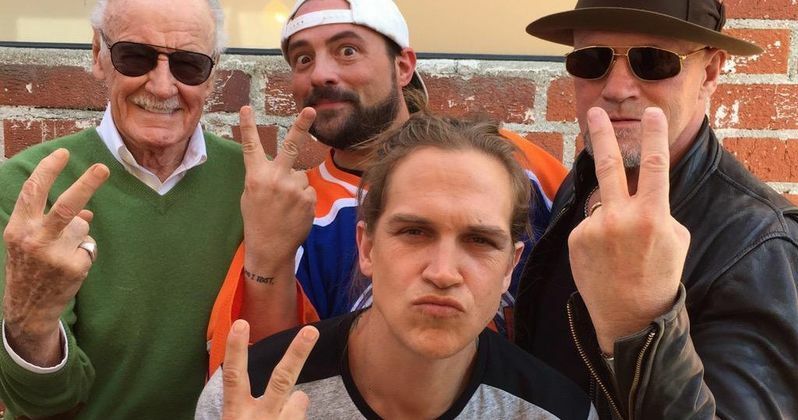 Earlier today, Kevin Smith took to his Twitter page once again, hinting that original Mallrats stars Stan Lee, Michael Rooker and Jason Mewes will be back for Mallrats 2. However, the director explained on his Facebook page that they all got together to actually shoot an Audi commercial that will appear online as a tie-in to Avengers: Age of Ultron, and he didn't exactly confirm that they will all be back for Mallrats 2. Here's what he had to say below. "We goin' back to the MALL, ya'll! Stan Lee, Jay and Silent Bob and Michael Rooker are making a number 2. Talking about in this picture, not the movie. I'm aiming for the movie to be good. (This pic was taken yesterday, as all four of us gathered to shoot a really adorable Stan-centric spot for Audi that you'll see online as we get closer to the release of Avengers: Age of Ultron.)" So, while these actors aren't necessarily confirmed for Mallrats 2 quite yet, don't be surprised to hear them signing on in the near future. Also, since Jason Mewes is likely coming back as Jay, it certainly seems possible that Kevin Smith will once again play Jay's sidekick, Silent Bob. Kevin Smith still has three more movies to shoot before Mallrats 2, including Clerks III, which starts production this May, followed by Hit Somebody in September and Moose Jaws in early 2016, so we have plenty of time before Mallrats 2 actually begins to roll. In the original Mallrats, Jason Mewes and Kevin Smith played Jay and Silent Bob, with Stan Lee appearing as himself in a cameo towards the end, where he gives a memorable speech to comic book fanatic Brody (Jason Lee). Michael Rooker portrayed the villainous Mr. Svenning, the father of Claire Forlani's Brandi Svenning, who is putting together a game show to be held at the mall. Are you excited that these characters may very well return for Mallrats 2? Take a look at Kevin Smith's photo, and stay tuned for more details. Mallrats 2: Will Ben Affleck Return? Mallrats 2: Jason Lee and Shannen Doherty Will Return!